I just read Alex Ross' excellent New Yorker piece, "The Classical Cloud: The pleasures and frustrations of listening online." You should, too. While Ross writes specifically about the classical music world here, what he speaks to is universal -- that all genres of music, in fact, that all forms of art are sensual at their core and must ultimately be experienced through, and by, the senses. Consider his article an SOS that, thanks to music streaming sites, this visceral connection is sinking fast. What we've lost in the Digital Age is that exact tactile, sensual connection to the majesty of our cultural world. We rarely, if ever, stop to view a painting, taking in its multidimensional scope and size or its craftsmanship and artistic eye. We rarely sit in the dark with a room of strangers, smelling the heady aroma of popcorn & sharing in a group reaction of fear or laughter to an over-sized image & sound. We've also been cut off from the joys of holding an album cover, viewing its artwork, reading its secrets, histories & participants, all in great detail… we're even losing its miniaturized version in CDs. Everyone who has lived a certain number of decades will surely tell you that much of what they have seen and experienced in life is cyclical. This is the very essence of a fad. Dress hems go up, dress hems go down, dress hems go all the way down. Rinse. Repeat. One core feature of fads is that they trumpet the obsolescence of whatever they are replacing. It's not enough to widen the field to house all views and tastes somehow, the new must replace the former utterly; and to accomplish that the former must be wiped away under heaps of scorn & condescension. A new fad's first tactic is to attach a derisive, discernible "'ICK' factor" to whatever came before it -- declaring that to enjoy the previous so dates you that all manner of social contacts stand prepared to shun you in your hopelessness. And so it goes, until the day the fad becomes mainstream itself, at which time it is replaced by a newer fad -- sometimes by a third thing, but often, given enough intervening time, by a return to the very thing it had tossed aside in the first place. The Dot Com Crash taught us that faulty, unworkable web enterprises cannot sustain themselves unless their potential value for the public far outstrips their potential for profit. In other words, an exciting cash generator for its creators will only stand if the public receives enough value from it that it can happily choose to ignore the billions of dollars squeezed out of the venture by its handful of creators & early capital suppliers. This is what separates viable businesses from commercial fads. Spotify is just such a fad. But one fraught with dangers for our times. It is a fad full of fury, corporate funding, backing & partnerships; full of loathing for what it seeks to replace: digital downloads & CDs, which in turn had replaced cassette tapes, which in turn had replaced vinyl 33 1/3rpm LPs, which in turn had replaced shellac 78rpm discs, which in turn had replaced shellac cylinders. However, from its outset, Spotify & its subscription peers have ignored one important element -- they're wholly dependent on what corporate types call "content," for which they rely on unsuspecting and often pliable young musicians -- those most desperate for a foothold in the marketplace so that they welcome any attention, even at the cost of no longer being able to make a living. This, all while the site generators reap millions in revenue, while sharing not cents on the dollar, but thousandths of a cent on the dollar. Millions of subscription-paid spins on these sites create revenue checks in the tens or hundreds of dollars in a payment period for the average artist, while large corporate labels (who have strong lawyers & bargaining positions) have created sweetheart deals where revenues are siphoned to their small stable of mega-artists at the sake of independent artists & lesser profile label artists (who have no lawyers or bargaining position). It's no great secret that the digital world has destroyed the musical marketplace utterly. Expectations within the music-enjoying public have been fully reformatted -- music fans no longer eke out some small sum of money with which they run to the music shop to buy the latest from their favorites. And the number of fans who've taken that same small sum to online discounters like Amazon, etc., has likewise cratered as well, as folks turn their backs on CDs & downloads & turn to the radio-esque feel of paid streaming. Pride in ownership of your favorite music has been replaced by an oncoming stream of "whatever they want to hand me is cool." By the major corporate labels blindly fighting the oncoming paradigm shift of the last two decades as if they could reverse the tides, digital pirates gained a foothold in the marketplace of ideas, showing the general public that music is nothing more today than a computer file, and as we all know, you cannot hold a computer file -- so obviously none of it is real, so none of it has value, so it all must be free. And with the accompanying sensual, tactual experience eventually cut away & demeaned, all music becomes the land of Meta data -- virtual sonic wallpaper. Without the proper reasoned rebuttal, the pirates' position became the public position. And the public position soon became the public expectation. Faced with this new expectation, the incentive to produce music for anything more than yourself and a few friends disappears. Across all genres of music, artists are considering leaving music altogether. It no longer pays. Oh, people are spending all right. But no one is buying. Not buying music, certainly. Today, they're buying web sites & algorithms. They'll buy Spotify's site & its new player toy. But not musicians who make what they listen to. 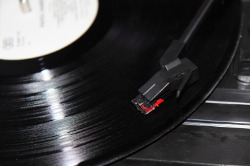 At what point does the small-but-perceptible movement back to vinyl grow into a new generation's revolt against the previous one's attitudes and decide to return to quality over convenience? We know that all things are cyclical, so how long will it be until the fad swings towards function & worth & value over form & ease & cheap? What we do know is if we do not return to buying our music directly & outright from artists we enjoy soon, the financial incentive to make music disappears; soon after that, the music streaming sites crater without new content and its founders walk away, counting their piles of cash. Music fans are left with nothing. No site telling them what to listen to & no musicians making music for them. A barren Mad Max landscape -- with no soundtrack. Support those artists you enjoy. Attend their live performances, and buy their recorded work. There is astounding talent surrounding us all, wherever we are. It's up to all of us to decide to support musicians… or to support corporate web site entrepreneurs/suits. Which can we groove to more?